The ExaFit adjustable massage stick is suitable for use before and after workouts and has been made for increasing circulation, soothing tight muscles and easing aches and pains. For extra deep tissue massage, you can choose from two different arrangements and the stick ensures fast and effective myofascial release. Ergonomic handles help to vary intensity, whereas a flexible core allows the cogs to contour to your muscles. 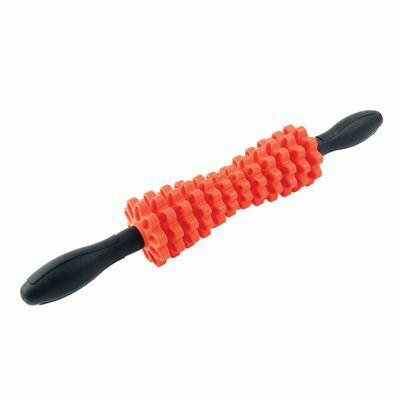 The massage stick is lightweight, portable and great for travelling. for submitting product information about ExaFit Adjustable Massage Stick We aim to answer all questions within 2-3 days. for submitting product information about ExaFit Adjustable Massage Stick. We aim to answer all questions within 2-3 days. If you provided your name and email address, we will email you as soon as the answer is published. for submitting product review about ExaFit Adjustable Massage Stick.